PORTAGE – Christopher J. Caswell, 31 years old, went to be with the Lord on Wednesday, May 16, 2012. Chris will be terribly missed. He is survived by: John & Jeanne Caswell (parents), Holli (sister), & Brian Berner, Jennifer (sister) & Clay Hendrixson, Heather (twin sister) Wiederhold, as well as his nieces, Hannah, Katelynn, Grace & Genevieve Berner, Weslee Wiederhold, Elia Hendrixson; nephews, Tyler Sweeney, Trevor Wiederhold, Weston & Hosea Hendrixson; grandparents, Norton & Norma Caswell and Robert & Louise McDonnell; all of his aunts, uncles and cousins; special extended family by choice, Randy & Sandy Ebben. Chris loved life! His entertaining spirit brought smiles and you never knew what surprises lay ahead. A Portage High School graduate who loved being on the stage and was noted for playing tennis. His musical talents shined on the saxophone with The Barefoot Soldiers band. 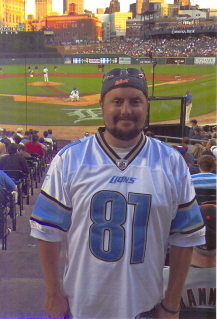 He enjoyed gourmet cooking (especially liked cook-off challenges), was an avid golfer, and a University of Michigan, Tigers, Lions, Packers and Brewers fan. He had many caring friends and was an involved uncle who took time playing catch, baseball, games and of course had special treats for his nieces and nephews whom he loved much. He also had the privilege of being honorary chair for the American Cancer Society 2009 Relay for Life. Glioblastoma Multiforme (brain cancer) has taken Chris, but will have no victory. Chris knew his Maker and what His Son (Jesus) had done for him – by taking on the sin of the world, dying on a cross, and being raised to life – so that he would have eternal life and be united with the Father. 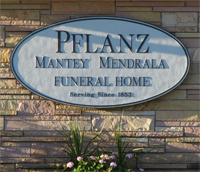 Visitation hours are 4:00 p.m. until 7:00 p.m. on Saturday, May 19, 2012 at the Pflanz Mantey Mendrala Funeral Home in Portage, and on Sunday from 3:00 p.m. until 4:00 p.m. at the funeral home. Please join us as we share about the many blessings despite the pain during a memorial service at 4:00 p.m. on Sunday, May 20, 2012 at the Pflanz Mantey Mendrala Funeral Home in Portage, with Pastor Thomas Gray officiating. The family of Chris would like to express their deep gratefulness to all who took part in making his time and ours so very special. You have given more than you know.